Daintree Valley Haven: All our own fruits - almost! All our own fruits - almost! Although we have dozens of different tropical fruit trees it's quite rare to have this many in season at once. I've just made up this breakfast fruit platter for our UK guests - apart from the 3 Limes which I don't think they'd appreciate for breakfast. 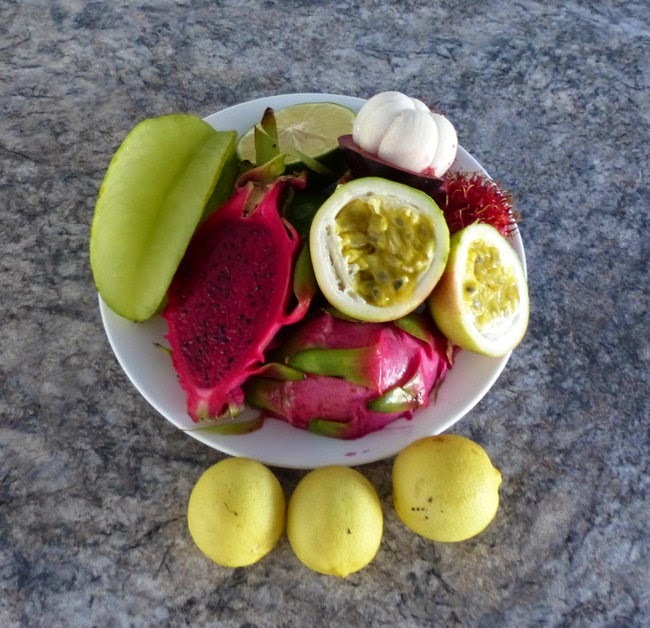 Lemonade-fruit, Mangosteen, Carambola (Star-fruit or Five-corner), Rambutan, Yellow Passionfruit and the amazing bright red Dragonfruit, the only one not grown on our property but thanks to our next-door neighbour!